Is Rene Morales blowing the whistle, or is he just talking trash? The longtime local contractor says the public will soon be able to judge for themselves. Morales says he is organizing a workshop to unveil evidence he says amounts to the county’s biggest scandal yet. It involves video tapes, county emails, billing statements from the local dump and other evidence Morales says he’s spent years and at least $50,000 collecting. “I’ve been waiting for county officials to do something about this for seven years,” he said. The Pahrump Valley Times has been given access to some of the information, which raises questions about county oversight of landfill operator Southwest Environmental Services and whether trash hauler Pahrump Valley Disposal is paying its fair share of tipping fees. These are fees collected from trash haulers by Southwest Environmental as part of its nearly $1 million contract with Nye County. Southwest has operated the county landfill since 2004. Morales suggests taxpayers have missed out on millions of dollars in uncollected fees since at least 2006. Morales says the $6.50 fee is supposed to be collected per every cubic yard of waste, except for residential trash, from trash haulers who use the landfill. Morales, himself a former owner of a construction trash hauling company called Mr. Clean, says he has evidence from 2006, but also as recently as 2012 and earlier this year that Pahrump Valley Disposal may not be paying its fair share of fees to Southwest Environmental, which happens to be mostly owned and operated by the same person, John Shea, a longtime business competitor of Morales. The allegations and much of the evidence Morales says he has was collected when he and Shea were engaged in civil litigation against each other. The tipping fee allegation was even addressed in court back in 2006, when it was called by Shea’s attorneys a false allegation. Morales, however, had video captured at the landfill over a number of days showing dozens of Pahrump Valley Disposal trucks entering and dumping loads of commercial waste. But he says when records were sought to see if the number of trucks each day, many of which carry 40 cubic yards or more of trash, matched what Southwest Environmental Services was billing Pahrump Valley Disposal, the records suggested lighter traffic than witnessed on the tapes. One document Morales showed the PVT was a Pahrump Valley Disposal billing statement for the construction debris it was charged to dump during the whole month of February in 2006. Just three drivers are named for the month and individual loads never reached more than 30 yards. Some days there were just two or three loads dumped, sometimes none. This in a year where $95 million worth of new residential construction — and hence lots of construction debris — was taking place. Under construction houses at Mountain Falls at the time each had a Pahrump Valley Disposal commercial trash bin in their driveway, according to video captured by Morales. “Someone call 911, I want to report a robbery,” Morales said while showing the tapes. Morales said he took his evidence to county officials in 2006. He said he met with former Public Works Director Samson Yao as well as former chief civil deputy district attorney, now judge, Ron Kent, and other officials. Dave Fanning, the current county Public Works director, said he inherited landfill oversight from Yao and that any questions about Morales’ allegations should be directed toward the DA’s office. Yao was fired in 2008 for authorizing $200,000 in spending at the landfill without permission from county commissioners. Calls to Kent and current Chief Civil Deputy District Attorney Marla Zlotek went unanswered. Calls to Pahrump Valley Disposal and Shea were not returned either. A file in the DA’s office reportedly shows evidence of an investigation in 2006 that reportedly mostly cleared Southwest Environmental and Pahrump Valley Disposal, though one county official with knowledge of the case admitted there were problems that were not made public. Gary Hollis, a consultant hired by Shea after Hollis left his seat as a county commissioner in January, said he’d try to get Shea to comment, but no such comments were made by press time. Hollis did confirm, however, that he has contacted a lawyer following allegations that he may have broken state ethics rules requiring elected officials to take a one-year cooling-off period before taking paid work with businesses they once regulated. As a commissioner, Hollis effectively oversaw the landfill contract. County emails Morales obtained during his court case seven years ago do suggest problems with oversight and collection of fees at the dump back then like he claims. One email from March 24, 2006 directed to Shea from Yao reveals a six-month gap in record-keeping where the county was unable to verify it was receiving its proper portion of landfill fees. “Since our last conversation approximately three weeks ago, whereby we requested specific documentation from you, we still have not received all of the Construction and Demolition Tickets for the months of October thru December of 2005 and for the months of January thru March of 2006. We are insisting that these records be delivered to our office no later than Monday, March 27, 2006. Further delay is unacceptable,” Yao wrote. This email followed an earlier missive from Yao that wondered why load fees were down from prior years before seeking a number of records to check that fees were being paid correctly. 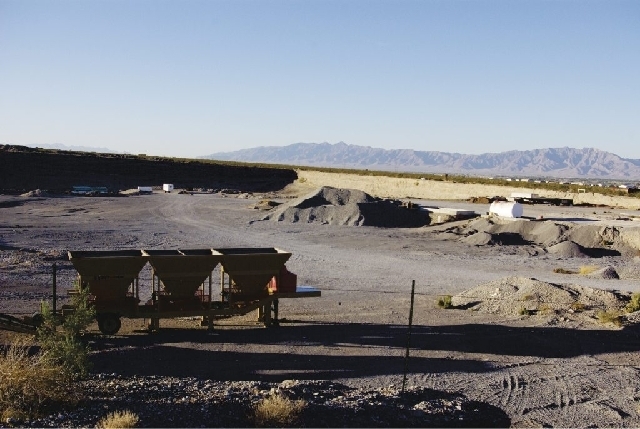 “We would like to take this opportunity to request a copy of the entire list of tire hauling companies that are currently utilizing the Pahrump Landfill and a copy of the record of fees collected for the tires and a list of all the current Construction and Demolition debris haulers that use the Pahrump Landfill on a regular basis,” Yao wrote in February 2006. Some of Morales’ allegations seem to be supported by other business people who compete or competed with Pahrump Valley Disposal in 2006. One business owner, who wished not to be named in this story, wrote a letter to county officials then raising similar complaints. “I came up to you about conditions at the landfill, also about VBL/Joe’s Sanitation coming out of landfill early this morning before (it) opened. They have been coming and going all hours of the night and early mornings to dump. How do they do that without getting weighed and checked in? How does the county get paid for this if it’s not being reported?” the letter asks. The letter went on to complain about Southwest Environmental and Pahrump Valley Disposal being essentially the same business. As far as dumping before the landfill opens, Morales says he has tapes of that going on, too. One shown to the PVT was recorded in December. After almost two years of litigation, costing tens of thousands of dollars for both of them, Morales and Shea settled their civil lawsuit in 2009. Shea bought Mr. Clean’s equipment. Morales won’t say how much he received in the deal, but insists he would have won his lawsuit. When he began developing plans to turn his giant, former gravel pit on Simkins Road into a construction debris landfill, he figured he’d have some opposition from Shea. That’s why he says he started taping the landfill again in December. He says he’s still unsure who is behind two expensive mailers and robo-calls made to Pahrump residents ahead of meetings in April and June regarding the landfill. A $10,000 reward Morales is offering for information naming the person responsible for the mailers has not yet developed any solid information. Channel 8 News, the Las Vegas CBS affiliate, aired a news story last week on Morales’ quest to get his landfill. The report suggested that his failure to get permission to open his pit to construction debris was racially-motivated. Morales has not yet said when he plans to hold a public meeting. Asked why he’s doing this, he says it’s because the authorities never properly investigated his earlier claims. And after his landfill ordeal, he says it’s time to change the way business is done in Nye County.